“Many years ago you could choose a foreign name without a problem, but nowadays you have to prove the meaning and the origin when you go to get the baby’s birth certificate in the city hall,” said Naresli Calito, a CFCA staffer in El Salvador. Naresli also said some parents mix names to form a single name, such as Fernatali, a combination of Fernanda and Natalia. Her own name, Naresli, is an anagram of Linares. “Now parents are looking for more unusual names and foreign names as Nicole, Emily or Amy,” Naresli said. In Colombia, parents often combine English names with local, popular names. For example, a girl might be called Michelle Daniela and a boy’s name could be Jason Andres, said our communications liaison Harrison Garcia Ruiz in Bogota. “They choose the name of a famous person and a typical name of the area,” Harrison said. Children’s names are changing in Colombia, as more parents look to foreign sources of inspiration. Harrison said some of the newer names include Allison, Shirley and Maddy for girls, and Donovan, Ethan and Wilder for boys. 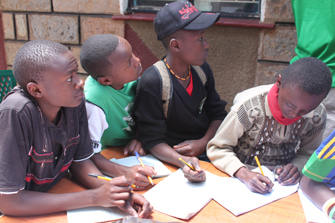 Youth in Kenya learn from CFCA scholars who have opened an academic club to help tutor children in their community. 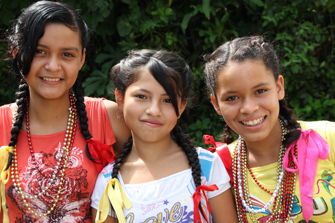 Kennedy, left, and Moses, right, are both sponsored through CFCA. Kenya has more than 40 ethnic groups, each with its own way of naming children. Regina Mburu, CFCA communications liaison from Nairobi, said parents from the Kikuyu community name children according to their family tree. “If the child is the firstborn son, he will be named after his father’s father, and if it is a daughter, she will be named after the father’s mother,” she said. The Luo community, on the other hand, names children according to the seasons and time of birth. Children born in the morning get special names ñ Akinyi for girls and Okinyi or Omondi for boys. Children born at nighttime are called Atieno for girls and Otieno for boys. Children born during the harvesting season are called Akeyo for girls, Okeyo for boys. Many people in Kenya are Christians, Regina said, so children often receive what are called “Christian” names (e.g. Peter, Thomas, Caroline and Joyce) at Baptism. The names may be from saints or the Bible, although Regina says sometimes the parents will choose an English name they like. However, many people have a second name linked to their particular community. Children also receive names based on popular celebrities, Regina said. For instance, you may find a boy named Denzel or a girl named Beyonce. What’s the most unusual boy or girl name you’ve ever heard? Share it with us in the comments! Most unusual name I ever heard was “Mossaphinia.” She was a customer of I business where I worked.